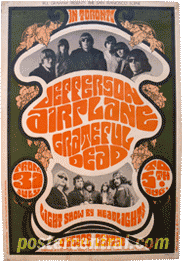 I will pay top dollar for original psychedelic concert posters like these: The Jefferson Airplane and the Grateful Dead in Toronto, Ontario, Canada, July 31-Aug. 5, 1967; The Buffalo Springfield in Fresno, CA, Feb. 10, 1968; The Jimi Hendrix Experience in Columbia, MD, Aug. 16, 1968; Bruce Springsteen (believe it or not) fronting his band Earth in Long Branch, NJ, Feb. 14, 1969; The Who and Led Zeppelin in Columbia, MD, May 25, 1969; and Janis Joplin in Ann Arbor, MI, March 15, 1969. 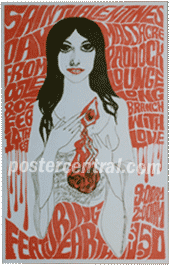 These posters are all original, all printed before the event for the sole purpose of selling tickets. 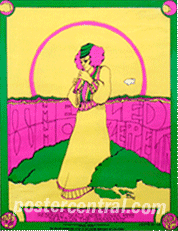 These authentic psychedelic concert posters are all from the genre’s heyday of 1967-1969. 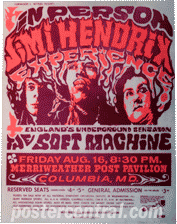 Psychedelic posters were characterized by swirling designs and colors, and a certain hip illegibility that often made reading the poster’s information a fun challenge. 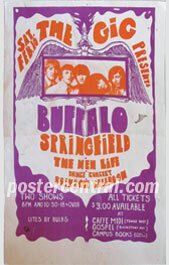 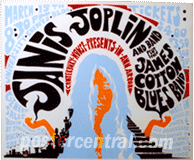 Standard photographs usually weren’t used on these posters (with a couple of exceptions here); the musicians were visually rendered with either approximating artwork or not at all, another playful hallmark of the psychedelic concert poster.